Buenos Aires is perhaps our favorite city in all of South America. A big reason is Buenos Aires’s lively street scene; including the San Telmo open-air antique markets, its array of outstanding restaurants, and Tango! Notwithstanding the various financial woes besetting Argentina over the past few years, Buenos Aires remains the country’s beaming star. European monuments and grand opera houses have become symbols of the city’s sophistication since the early 20th-century, when agricultural wealth from the nation’s heartland transformed the capital. Easter Island provides much needed, quiet relaxation after a few days in the bustling cities of Argentina and Chile. A visit to this culturally compelling site, which you can learn more about here, allows one to learn more about the ancient Polynesian civilization that constructed the imposing statues that decorate the island to this day. Upon arrival in Buenos Aires, you will be privately transferred to Alvear Palace. Following breakfast, you will take a tour of southern Buenos Aires, visiting Plaza de May, Metropolitan Cathedral, and Casa Rosada (Presidential Palace). You will continue to the colorful barrio of La Boca, originally settled by Italians from Genoa. You may take a visit to open-air markets like San Telmo and Plaza Dorrego, offering crafts, antique shops, and tango events. You will be privately transferred to the local pier to board the hydrofoil and navigate about one-hour through the River Plate until Colonia de Sacramento (Uruguay), a UNESCO World Heritage Site. Enjoy a full-day of touring Chile’s many noteworthy wine valleys, stopping at Loma Largo vineyards and the Rosario Valley estate in the San Antonia Valley. Following your arrival at Easter Island, you will be privately transferred to Explora Rapa Nui for a three-night stay. Using the Explora Rapa Nui as a base, you will take excursions throughout Easter Island, host of the giant “moai” stone-faced structures, exploring the mystery and mysticism emanating from this ancient Polynesian civilization. 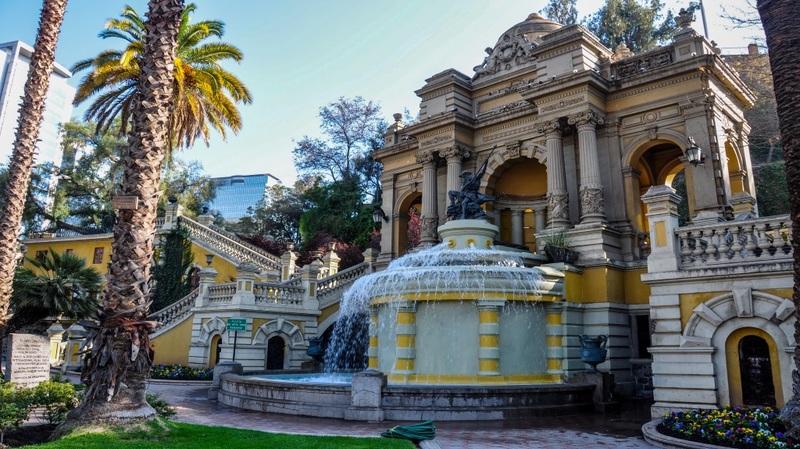 After arriving back in Santiago you will be privately transferred to the Singular Santiago for your overnight stay. The Alvear Palace is widely considered the most luxurious 5-star hotel in all of Buenos Aires. Its 197 rooms are designed in Louis XV and Louis XVI styles, all with butler service. Most of the bathrooms here have LCD televisions and separate showers. The only amenity that the Four Seasons has over the Alvear is an outside pool. The Alvear is THE iconic luxury hotel in Buenos Aires! The Explora Rapa Nui is an environmentally friendly, somewhat spartan lodge located on a hillside, with beautiful views of the Pacific Ocean. You can’t beat the hiking, biking, snorkeling, and diving excursions available at this 30-room Explora lodge close to Easter Island, a perfect place to disconnect and get in touch with nature! Although past clients have enjoyed the food here, bear in mind that almost everything must be flown in on a five-hour flight. A recent client enjoyed the small massage salon and small pool.